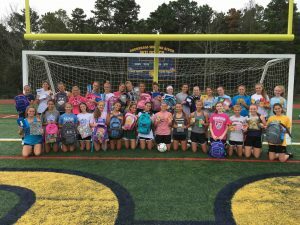 In addition to their dynamic performance on the field, the Shoreham-Wading River varsity and junior varsity girls soccer teams exhibited a sense of community when they conducted a school supply drive and collected more than 25 backpacks for the Kings Kids Christian Outreach program in Mastic Beach. They filled each backpack with necessary school supplies for elementary students to be ready for the first days of school. Photo caption: Shoreham-Wading River varsity and junior varsity soccer teams display their school supply collection.